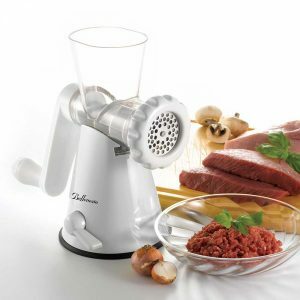 When it comes to home appliances, choosing the best meat grinder might seem like one of the hardest tasks. I certainly felt that way when I decided to get into the world of home meat grinding, which is precisely how Prepping Meat was born. 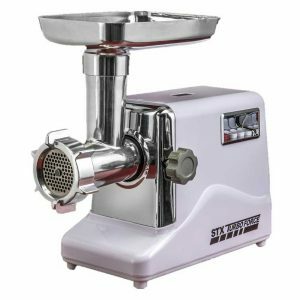 Here, you can find all the information you need to shop with confidence and avoid all the frustration and confusion that comes from trying to shop for a new meat grinder on your own. Below are my reviews for the best meat grinders I’ve seen, to help you on your way to home meat grinding perfection. Grinding up your own meat at home isn’t the most delicate of jobs, even if you’re working with only lean cuts without any bones. But what do you do when you’ve got a few dozen pounds of chicken or turkey that you need to break down? You turn to this heavy duty meat grinder from STX International. After taking a look at the full specifications for this grinder, it’s very clear that it’s built to withstand some serious use without slowing down or running into hitches. At it’s peak output, the motor can deliver a stunning 3000 watts, which is absolutely going to be enough to work through almost anything you could bring into your kitchen. It also has a #12 size grinding shaft, which comes out to 2 ½ inch output opening for your ground meats and a 2 inch intake shaft on the feed tube. That might seem small when you look at the numbers, but if you think about the cuts or chunks of meat that you’re going to be working with, it’s a very sizeable amount of space that will enable you to achieve a pretty high yield. When you don’t need to cut up your meat into super small pieces, you can get more done in less time. Another of the wonderful features on this grinder is its three-speed adjustable grinding control, which really opens up the possibilities for how you use it. Unlike other models, which only have a basic “on/off” setting, this grinder has two different speeds in the powered mode: high and low. On the low speed, you can work your way through thicker or more course meats, as well as run it with one of the various attachments it includes for preparing specialty meats, as well as turn it up to max power to really blast its way through your meats. The final speed is actually a reverse mode, which is invaluable when you run into a piece that’s particularly tough, since you can feed it back to clear out the feed tube. I also really like that there’s a circuit breaker on this model, to help increase the overall safety. 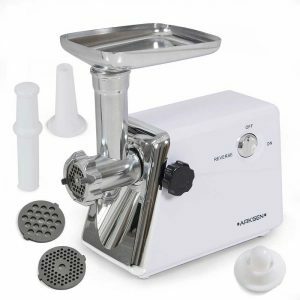 For those of you that prefer to do things the old fashioned way, or that simply want to have an appliance that takes up as little space as possible in your kitchen, then a manual meat grinder is what you’re looking for. Of all the ones that I came across, this model definitely takes the cake in terms of features and simplicity. The biggest benefit of a manual meat grinder is that it doesn’t require any kind of external power source, aside from your own two hands to turn the crank, of course. This is great for a lot of reasons, including the fact that it can help keep your energy bill lower, it poses less of a safety hazard if you have little kids running around the kitchen, and the fact that you can operate it literally anywhere you like. Manual meat grinders are also much less costly to repair compared to electric grinders, since there aren’t any specialized mechanics or motors that you would have to order or pay a professional to replace. On top of all of that, this unit also comes with a locking mechanism, which you don’t always find on manual models. You can probably already guess that the first tool here is the meat grinder, which would already make this a very impressive piece of kitchen equipment if that was where it ended. However, grinding meat is only the start of what you can accomplish with the Kitchen Basics 3-in-1 grinder. If you unscrew the protective ring on the outside of the output shaft, you can swap in two different stainless steel screens (one of which is very fine, perfect for mincing) so you can process vegetables or herbs right in the same product. There’s also a sausage-making attachment, as well as two additional plates that allow you to actually use the grinder to make your own pasta. You can choose between a traditional spaghetti style pasta as well as a thicker rigatoni style pasta, making this one of the most versatile tools you could possibly have at your disposal. When you’re new to the world of grinding your own meat, there’s just no need to go out and purchase one of those high-end luxury or industrial models, as you’re most likely not going to be working with the thicker or more exotic types of meat that they are designed for. In that situation, you want a basic yet dependable meat grinder to help you learn the ropes of the whole process, which is exactly what this model from Della was made for. Caring for a meat grinder can quickly become a cumbersome task if you don’t take the right steps to keep it clean and sanitary, and unfortunately some models do not make it easy for you to do this. Knowing that, I was quite impressed to learn about all of the easy cleaning features of this meat grinder, since anything that can help speed up or simplify cleaning is a huge bonus in my book. First of all, the blades are removable, which is a major part of what makes this great for beginners since most novice grinders won’t know how to really get into the nooks and crannies to clean out the machine. Additionally, the parts are made of stainless steel, which means you can simply wash them in your sink with some mild detergent and warm water, and they’ll keep looking bright and shiny while retaining their sharpness. Just because you might not have a lot of experience with grinding your own meat doesn’t mean that you don’t want to be able to explore all of the food preparation possibilities that come with owning a grinder. Instead of making this a bare bones grinder with no additional features, you actually get a great base model that comes with multiple grinding plates and attachments. With this model, you get three different grinding plates that allow you to get a coarse, fine, or medium grain to your products, so you can really try out new methods and discover what settings really work best for you. There’s also a kubbe attachment, which allows you to make the traditional Middle Eastern stuffed meat pies that would otherwise be quite difficult to make by hand. Anyone who’s spent even a few hours in the kitchen preparing food knows how invaluable and versatile a stand mixer can be, largely due to the fact that it can support a breathtaking array of attachments that allow it to accomplish all manner of different tasks. If you have a stand mixer, you can use this attachment to turn it into your very own meat grinder. This model is designed to function with the timeless and unbelievably powerful KitchenAid stand mixer, which is pretty much the gold standard for home kitchen stand mixers. 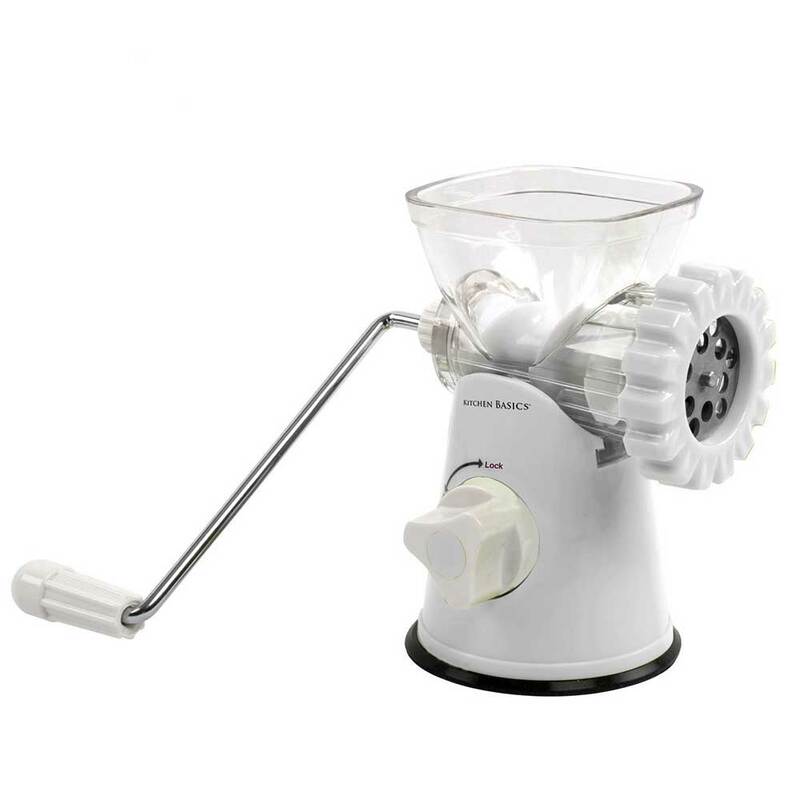 All you have to do to get this device up and running is remove the cover on the multi-purpose access connector at the front of the mixer and attach the grinder attachment. When you power-on the mixer, its motor will turn the mechanisms inside the attachment so you can feed meats or vegetables and achieve that beautiful final product you’ve been dreaming of. Clean up is also very simple with this model, since you only need to detach the grinder and focus on that part, which you can place in the dishwasher if you prefer. It’s one of the simplest methods for grinding meat, since you only have to make room to store the attachment in a kitchen drawer or cabinet. 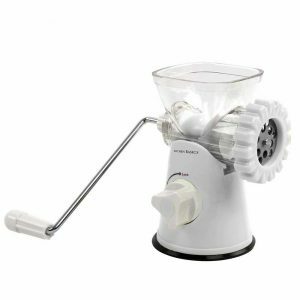 As I said, stand mixers are among the most useful tools you can have in your kitchen, and with this attachment you can add several more functions to its already impressive repertoire. In addition to the standard grinding of meat and vegetables, you can switch the included grinding plates out so that you can grate hard cheeses or even mince garlic. This really becomes a full-purpose meal prep machine once you get his attachment. Think about it, if you wanted to make meatloaf you could use the grinder to grind up your meat, slice up some veggies, make your own breadcrumbs, and then mix them all together right in the mixing bowl. It really doesn’t get much easier than that. 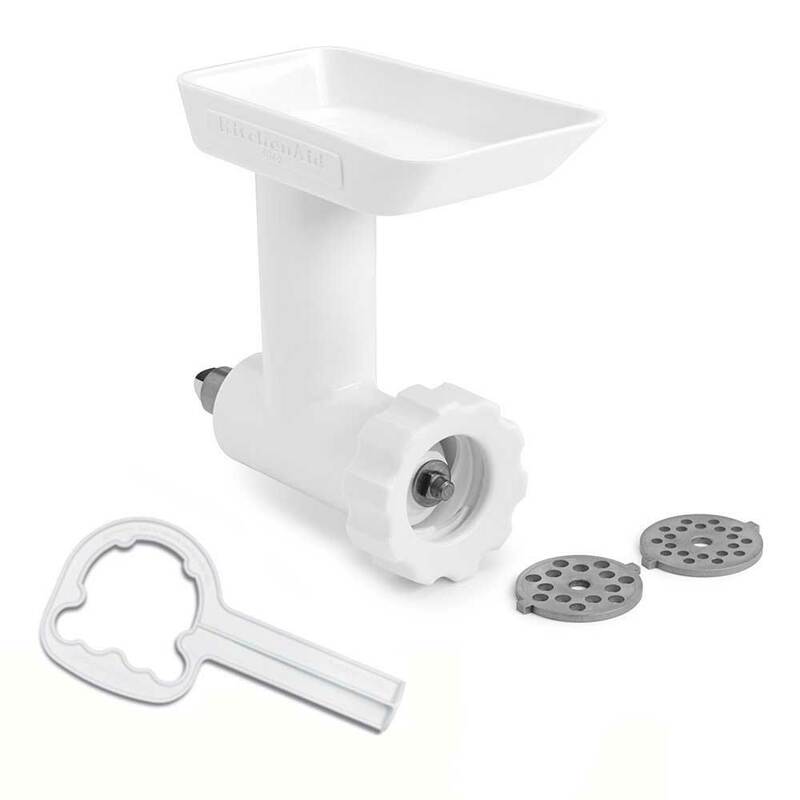 You can also purchase additional attachments to expand the feed tray, make pasta, and so much more. When you’re trying to keep your costs low, but still want to benefit from the ease of use and time-saving power that comes from an electric meat grinder, you might feel like it’s an impossible task. Thankfully, with this amazing little appliance from Sunmile, you can actually get an electric meat grinder that’s both functional and affordable. In most cases, the meat grinders that come with a lower price also come with lower power, as it’s pretty much the easiest way for manufacturers to cut costs for consumers. Unlike those other models, Sunmile managed to retain an impressive amount of power in the motor of this grinder while still keeping it at a very affordable price. With a base power of 250 watts, and a maximum drive of 800 watts, you can rest assured that you’re going to have enough power to grind up beef, chicken, and practically anything that you could pick up at your local grocery store. All in all, Sunmile promises that you can grind up to 150 pounds per hour, all from the comfort of your own home. Sometimes so called “budget” models can really skimp out on the design, leaving you with a product that’s hard to understand and incredibly user-unfriendly. The wonderful news here is that with the SM-G31, that is absolutely not the case. Instead of hiding the power switch somewhere out of sight or inconvenient to reach, or leaving you with a confusing number of dials and toggles that don’t really have much of an effect of the process, there is a very simple on/off switch placed right on the side of the grinder. Right next to that switch, on the same side, is a locking dial that allows you to tighten or loosen the feed chute, so you can insert one of the various grinding plates that come included with the appliance. You also get a plastic food pusher with this model, which is going to be a huge benefit to ensuring a smooth flow through the feed tube. If you’re anything like me, you prefer to have backups around for your appliances and tools in case there’s a malfunction or some other kind of unforeseen incident. That kind of foresight is precisely why I think the Bellemain Manual Meat Grinder makes the perfect backup grinder addition to your electric grinder. You really never know when you’re going to run into a sticky situation in the kitchen that leaves you at a disadvantage, like a power outage or a need for multiple people to work on food prep. Having a handy, compact manual product like this will ensure that, when it comes to meat or vegetable grinding, you’re always going to be prepared. Sometimes a tough piece of meat with a thick bone can jam up even the best grinders, so having a manual grinder you can break out to help finish the job could be a real lifesaver. Similarly, if you want a kitchen partner to help you make pasta or mince up some vegetables while you’re grinding the meat, you can station them at this bad boy and keep the whole workflow moving forward and a fantastic pace. Being able to put your utensils or appliances right into the dishwasher after you’re done is basically the holy grail of kitchen life. 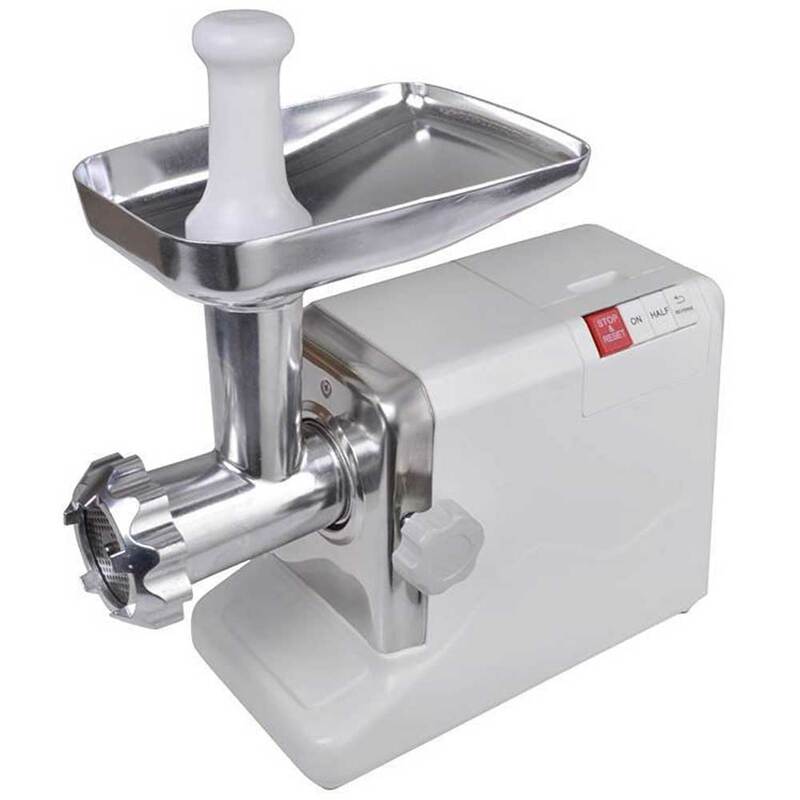 This meat grinder is made of sturdy plastic in the base, while the grinding disc and blade are made of stainless steel, so you know that you’re going to be able to achieve high quality grinding and won’t have to worry about the metal wearing away over time. Bellemain designed this compact grinder to be completely collapsible, so you can remove each part and put it right into the dishwasher. Not every grinder out there is dishwasher safe, so it’s honestly a fantastic benefit to have, as it will help you speed up the cleanup and allow you to spend more time enjoying the dishes you create. The base also has a suction cup built in to allow for a firmer grip on the counter during your grinding. One of the greatest uses a home meat grinder has it giving you the ability to prepare your food in bulk. That kind of use can be quite demanding, which means you’re going to need to strong and sturdy grinder to keep up with the hard work. 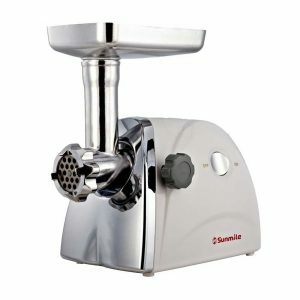 This model is a butcher shop-quality grinder that should definitely be able to stay the pace with your bulk grinding. Unlike a lot of other grinders, or kitchen appliances in general, this model is made out of cast aluminum, which is an incredibly strong and dependable metal that is made to withstand a lot of wear and tear. It’s created in a process that is similar to that of cast iron, and if you’ve ever used a cast iron skillet then you know exactly how tough and reliable those can be. Working in bulk may not happen very frequently, but when it does you know that you’re going to be using it quite extensively, so having a machine that’s strong enough to handle what could amount to hundreds of pounds of meat in a day means that you won’t have to worry about burning it out or breaking it when you’re just getting started. The core of this grinder isn’t the only part that’s built to deliver high quality output, as it also comes with a cutlery grade stainless steel cutting blade. You definitely want to have a serious blade like that in your meat grinder when you’re working on bulk preparation, as it’s going to allow you to work with a much broader range of meat types and other food products. One common use for bulk meat grinding is to prepare your own dog food out of rough meat cuts like chicken or turkey. Since the cuts have bones in them, and the bones can be very harmful for dogs, being able to feed them through the grinder without deboning first will save you hours upon hours of labor, as well as quite a pretty penny at the butcher since you can buy the bone-in meats. 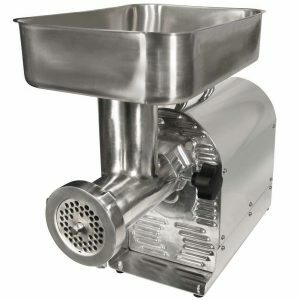 As powerful and effective as some of these home meat grinders can be, there are going to be some of you that are looking for a product that can function on a commercial level, whether it’s for your own artisan butcher shop or because you’re preparing meat products for a restaurant or similar business. If this sounds like you, then you will definitely want to check out this commercial meat grinder from Weston. The component that really sets this meat grinder apart from the rest is it’s commercial grade motor, which is designed specifically with the type of rigorous, daily use that comes from a business environment in mind. This 0.5 horsepower motor has all metal gears, which is extremely important in a commercial product because it extends the life of the unit immeasurably. With plastic gears, the internal components can wear down over time with excessive use, eventually stripping the gears and preventing you from actually using the machine. On top of that, the motor is permanently lubricated, so you don’t need to worry about doing that yourself, and it also has it’s own air cooling system to prevent overheating. The cutting blades and grinding plates are all made of stainless steel, to help prevent wear and maintain the quality of the final product. You also get multiple attachments to help you prepare sausages or other meat products, along with an extra large rectangular hopper to give you tons of room to prep your meats for the grind. All in all, this machine will allow you to grind up to six pounds of meat per minute, which is considerably more than you would ever need to do in a home setting but right in line with the demands of a commercial business. 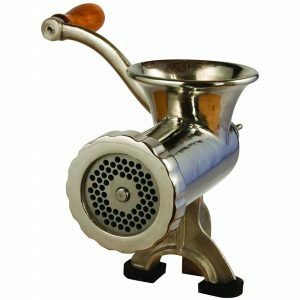 This is definitely a meat grinder for those of you that prefer things the old fashioned way, or that like to have a bit of vintage flair in your homes. It’s a manual meat grinder that you can attach to a countertop or other flat surface, and has a beautiful classic look that really makes it stand out. Part of the charm of this manual meat grinder is its vintage look, as it really does seem like it’s coming straight out of a Chicago butcher shop at the turn of the century. In addition to making it visually quite interesting, the design also has a great functional purpose as well. Since it’s made out of stainless steel, the entire grinder is rust resistant, which is very important with a product like this. If rust builds up, then it can limit its ability to properly grind meat, as well as become a health hazard, since the rust could actually pass into the food. Unlike the other manual meat grinders which sit flat on your kitchen surface while you use them, this model must be clamped onto a counter or table ledge. This clamping mechanism allows for a sturdier footing, meaning that you don’t have to put so much effort into holding the base in place to prevent moving. I also really like that this model has a wide mount, so you can use it with a good variety of surface thicknesses, rather than just being limited to thin countertops or tables. The clamp functions on a standard screw tightening system, so you can control how firm the grip is and don’t have to worry about any bending or breaking from springs or hinges. That concludes my reviews for the best meat grinders available for purchase, and I hope that you were able to find it all useful. These products seemed so overwhelming when I started, but as you’ve seen, getting to the bottom of the best qualities of each model is actually much easier than it seems. 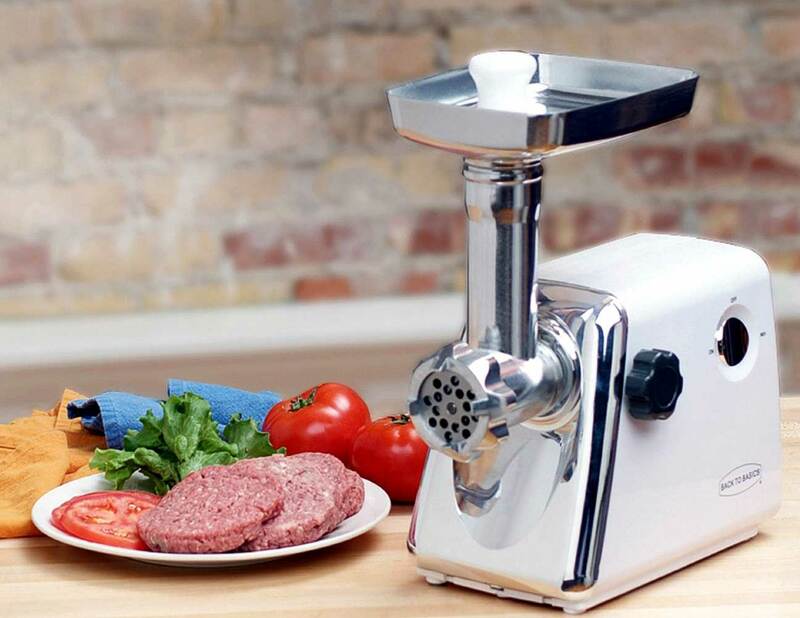 Make sure to visit the other pages on this site for more detailed information about buying your own meat grinder, including some tips for specific situations like saving money or prioritizing safety. May your grinders always be full, and your meats always lean!